Considering the new and innovative features the iOS 12 comes with, it isn't surprising that numerous users are excited to upgrade their iPhones and iPads to the latest iOS. Unfortunately, countless users have been having challenges installing iOS 12 on their iPhones. If you are experiencing such, we have some tips that will help you. Method 2: iPhone Won't Update to iOS 12? Why not Using iTunes? Insufficient storage space on your device. The iOS beta version is still running on your device. Unstable Wi-Fi or internet connection. Your iPhone may be low on power. Incomplete or broken update file. Insufficient space on your iPhone can cause "iPhone won't update to iOS 12" issue, because iOS updates usually require about 1.5-2GB free space. It is therefore very important to check and make enough space for the update by removing unused or unwanted contents from your phone. You can delete apps or games you no longer use, clear your cache files and other unneeded files like cookies, temp files, notes, calendar events, or delete large videos, music or pictures from device memory to create enough space to create space for the upgrade. 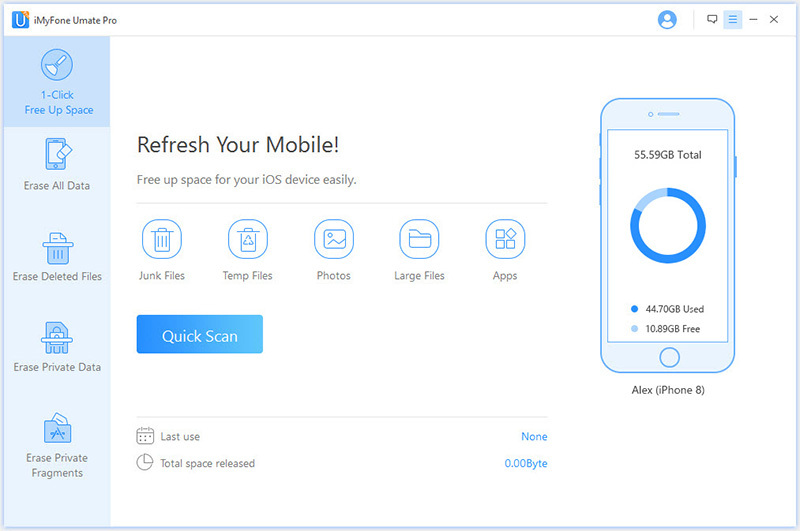 In case you don't have enough space on your device, you can clear some space using the iMyFone Umate Pro. It is the ultimate iPhone Data Eraser that comes with unique features for freeing up your iPhone. It provides fast, easy and reliable procedures for cleaning up junks, third-party apps, and unwanted files. One click to free up space for iOS update on iPhone. Save space on your device by clearing out unused files, delete third-party apps fragments, compress/delete large files, etc. Completely clear out unwanted files by wiping out deleted files and left-over fragments from third-party apps. Compatible with iOS 12 and all models of iPhone. Step 1. Connect your iPhone to computer and launch iMyFone Umate Pro. Step 2. Choose 1-Click Free Up Space mode and click on Scan button to start the scan process. Step 3. 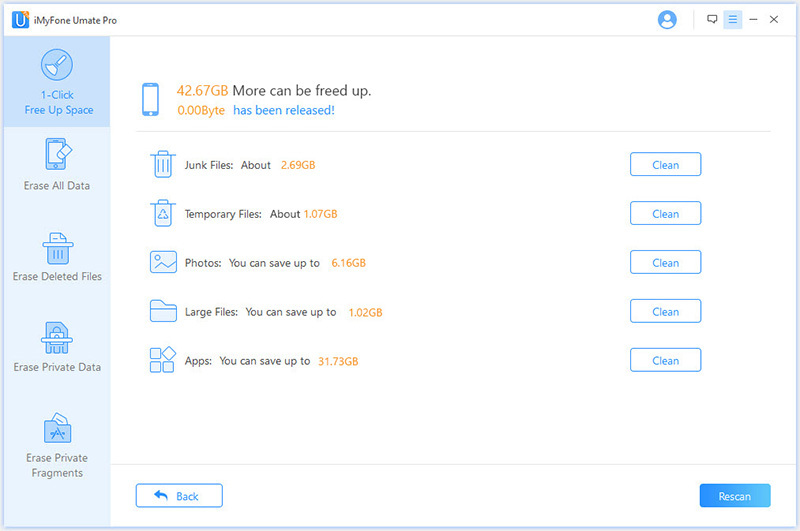 After scanning, you will see how much storage can be freed up. Click the Clean button beside each option to free up space for iOS 12 updating. Erases previously deleted data, without any chance of recovering. Preview data before erasing, and can erase individually. Erase data from third-party apps, such as Whatsapp Messages & Attachments, etc. #2 iPhone Won't Update to iOS 12? Why not Using iTunes? It is common knowledge that OTA (Over the Air) updates are usually easier and more convenient to perform, and most iPhone users, therefore, prefer to upgrade using OTA. However, OTA installations often lead to "iPhone won't update to iOS 12" issue, either due to weak Wi-Fi network/internet connection signals during the update, or accessing the Apple servers when they are busy due to a large number of users trying to upgrade at the same time, and so on. Consequently, in such cases, we would recommend updating manually using iTunes. The process is equally easy and fast. Step 2. Click the "iPhone" button just at the top of the window to select your device. Then click on "Summary" > "Check for Update." Step 3. Click "Download and Update" to confirm you want to update your iPhone. Step 4. Enter your password if asked. Then, your device will be successfully updated to the iOS 12. It is very important to ensure that your iPhone or iPad has sufficient power (over 50%) charge level before attempting to upgrade. If not, make sure you connect your device into the charger when you want to upgrade to iOS 12. This is because backups take a while, and you don't want your battery to run out of juice during the process. Have you tried all the above tips, and you're still having issues updating to iOS 12? Then try doing a factory reset. This will wipe your device completely, so it is very important to do a backup before resetting factory settings. 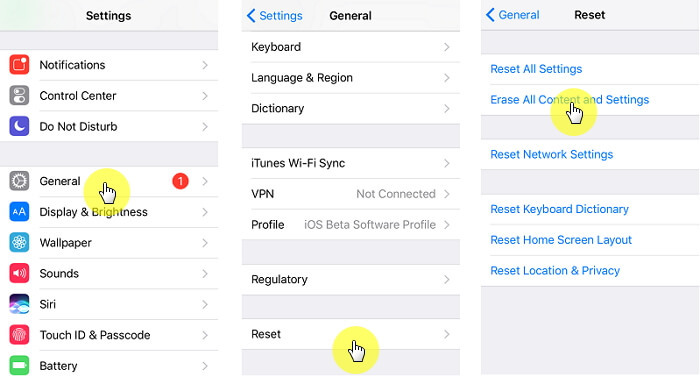 To reset, go to Settings > General > Reset>Reset All Content and Settings. You might be required to enter your password to confirm, and then your device will restart to the default settings. This should then allow your device update to the iOS 12 without any more huddles.